1. Remove the salmon from the fridge 20 minutes before serving. Arrange the salmon slices evenly over a large platter or serving plate, leaving about 2cm clear all around the edge. 2. Make the dressing: put the sugar, lemon juice, lemon zest, lemongrass and 3 tbsp cold water into a small pan and bring to the boil. Simmer for 5 minutes. Remove from the heat, allow to cool slightly then place in the fridge. When completely cool, add the olive oil and soy sauce and whisk together thoroughly. Remove the lemongrass and set aside until ready to use. 3. 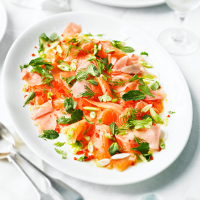 Spoon the dressing over the salmon, scatter over the sliced ginger, salad onions, chilli, mint, coriander and dill and serve immediately.